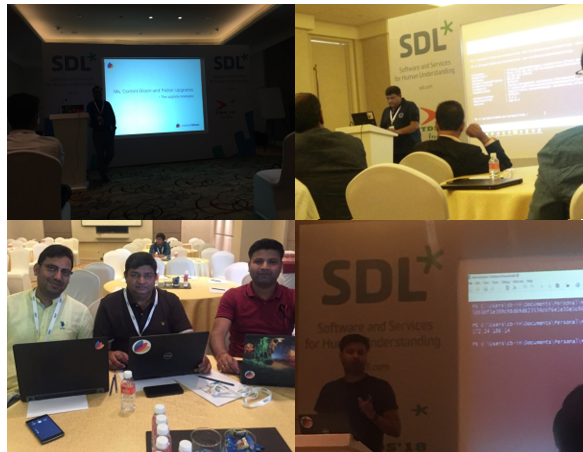 The fourth version of two day long SDL Tridion summit held in Bangalore on 23rd and 24th March 2018 at Hotel Park Plaza. Content Bloom has an active participation presenting different topics and sharing the experience with the participants from all over the globe including representatives from big customers and partners as well as technical people from various organizations. I presented the session on Upgrade Strategies and the various learnings Content Bloom has while performing numerous upgrades from older version of SDL Tridion to the latest ones. I discussed about the 3 main strategies to upgrade viz. Also discussed the advantages, disadvantages and suitability of each of them in specific scenarios. Priyank Gupta, Technical Consultant at Content Bloom, presented a very enlightening and engaging session on utilizing the core service via powershell script. Priyank talked about the Powershell Core Service module built by Peter Kjaer and the step by step process to use and even adding more functionality to it. An end to end demo of setting it up and interacting with core service of a specific Tridion instance to perform some nifty work was quite great. Hem Kant, Technical Consultant at Content Bloom, presented a lightening talk about Containerization, Docker and setting and running a DXA based application in Docker container. A step by step demo of creating and executing a Docker File, setting up the DXA application in the Docker and running the DXA based web application from Docker Container was a great learning for the audience. I presented my second session of this TDS which was demoing Content Bloom’s experience in creating a demo website utilizing the Universal Delivery Platform (UDP) and creating a content mash-up from SDL Web (now Tridion Sites) and SDL Knowledge Center (now Tridion Docs). The demo shows a website targeted towards banking vertical and generating a content mash-up of structured content like Loan Processing Forms, Account Opening Form etc. (managed in SDL Knowledge Center/Tridion Docs) and Web Content like News, Articles etc. (Managed in SDL Web/Tridion Sites). The content is fetched in a unified way through a single DXA based application from Knowledge Center (Tridion Docs) and SDL Web (Tridion Sites) by utilizing various Unified Delivery Platform micro-services and displayed on the web pages or sections on a web page.